Agilent Technologies introduces a range of extremely fast logic analysers featuring an industry-leading state capture speed of 4 Gb/s on 68 channels and 2.5 Gb/s on 136 channels. The Agilent U4154A AXIe-based logic analyser modules are capable of reliably capturing data on eye openings as small as 100 ps by 100 mV. 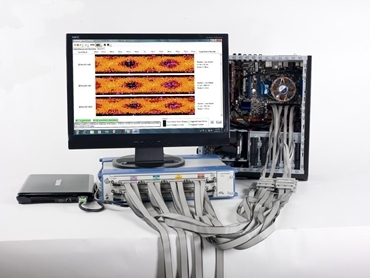 Agilent’s logic analysers allow engineers to measure the increasingly fast digital signals used in emerging technologies as well as validate and troubleshoot their designs with confidence. The Agilent U4154A AXIe-based logic analysers, associated probes and powerful analysis software provide essential capabilities for engineers working with DDR memory systems, high-speed application-specific integrated chips, analogue-to-digital converters and field-programmable gate arrays operating at speeds up to 4 Gb/s. Timing zoom provides simultaneous state and timing measurements with 80 ps timing resolution and 256 K-sample memory depth. Perry Keller, Agilent's representative on the JEDEC DDR committee says that the need for reliable measurements and deep analysis has reached a critical juncture as engineers who focus on high-performance servers and embedded systems begin work on DDR3 2133 systems. Ross Nelson, General Manager of Agilent's Digital Debug Solutions product line comments that the introduction of the logic analyser will help their customers continue to innovate as digital bus speeds increase. He adds that the new module delivers on the AXIe standard's promise to enable unprecedented performance in an open, modular form factor.